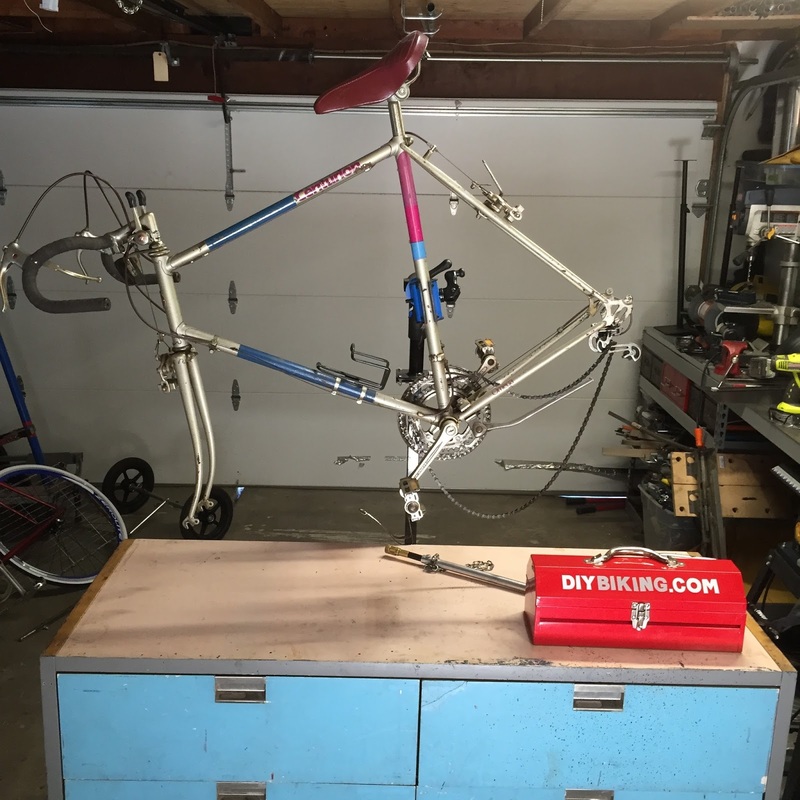 DIY Biking | How bike builds, bike travel and bike life can save the world: DIYBIKING.COM Asks: #WhyAFixie? Note: This post covers how I went about building a fixed gear bike but it will be followed up on on a later date with more information about why people use fixies - if I can find a reason. 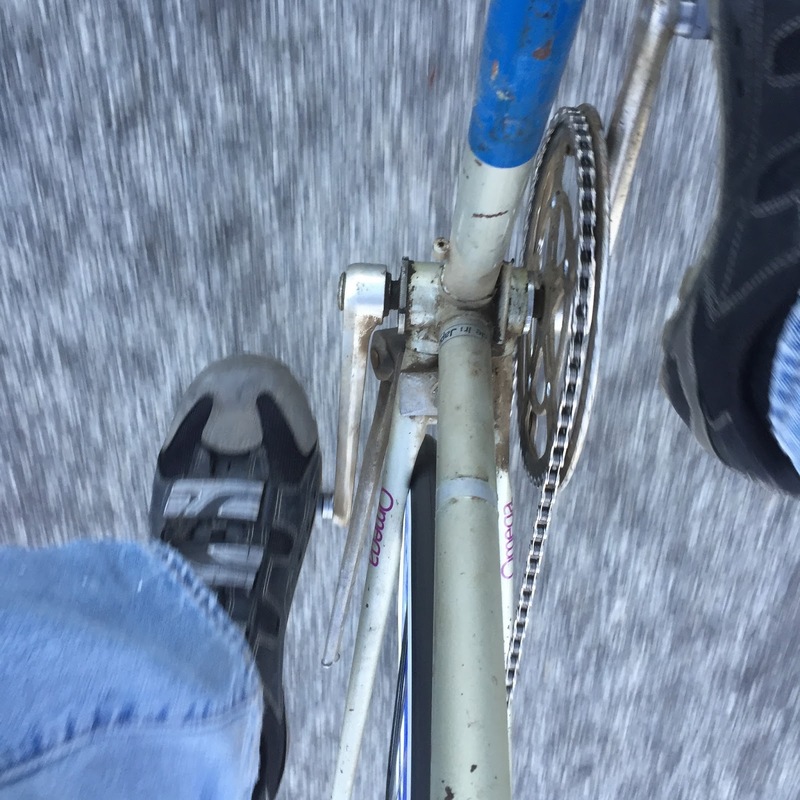 So if you ride a fixed gear bike and are on Twitter follow me at @michaelknorris and tweet your personal reason you ride a fixed gear bike using the hashtag: #WhyAFixie - and I'll cover the most entertaining Tweets in another post. A couple of years ago I built a single speed bike under the headline Unleash the Hipster Within. But thanks to a cheap fixed gear wheelset I bought online (and an old steel frame I bought at the always-fantastic Good Karma Bikes in San Jose) I headed to the valley between the twin peaks of hipster culture and bike subculture. Yes, I built a fixed gear bike - also known as a fixie. 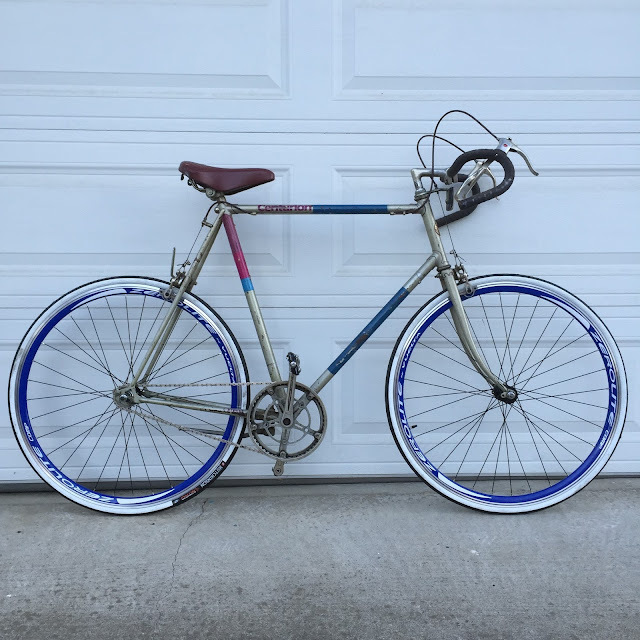 For those of you who haven't spent time in the really cool cities like New York or San Francisco: a fixed gear bike, as the name implies, is a bike with one gear that is fixed to the wheel, which means the pedals are always turning and the rider's legs are always moving (no clickclickclickclick sound/no coasting). If you're well-practiced, you can pedal backwards, slow down and stop just by using your legs. If you aren't well practiced you can fall harder than the coyote in a roadrunner cartoon. Fixies have been staples of hipster culture for so long I wondered if one could objectively look at the fixie trend and see if the Tinder-using, flannel-wearing, irony-wielding, gluten-free, locally-sourced hipsters are actually onto something with fixed gear bikes…or if they aren’t. The only way to figure that out was to build a fixed gear bike myself (even though I have no experience riding one) and ride it for a couple of weeks (hence the 1,000 Words for Sunday pic). 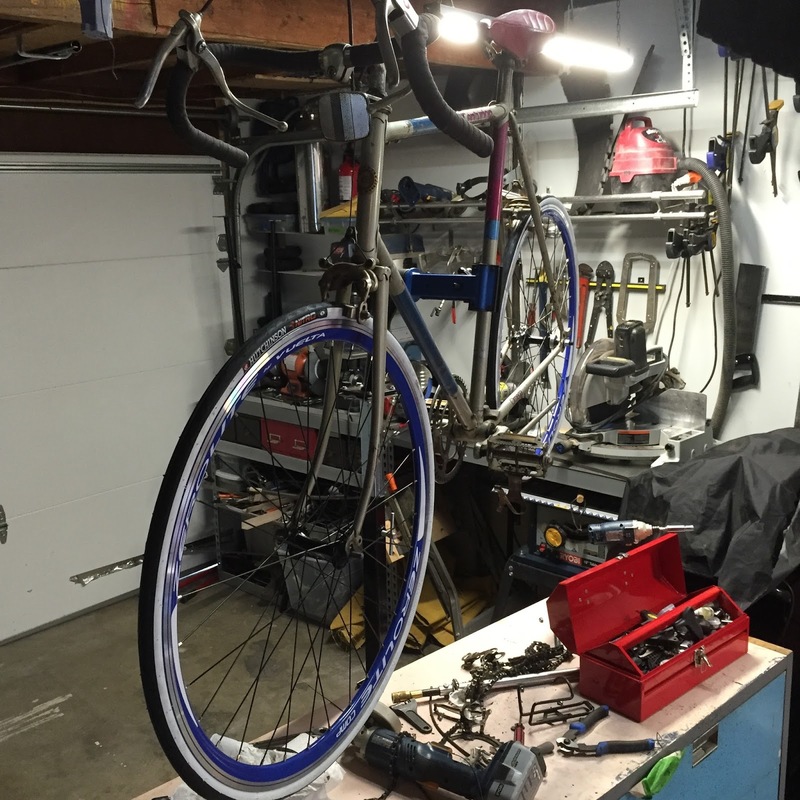 Now a common reasoning for building a fixie is the simplicity of the machine. So far, so good. In less time it took to get through ‘Batman Begins’ - which was playing on the DVD player in the shop for background - I had my own fixie. The Centurion frame I bought - other it being big enough for Stephen Merchant to need a spotter before mounting it - is a decent frame that had the proper dropouts that allow for a fixed gear wheel. I stripped off the derailleurs, shifters and the inner chainring before putting the back wheel on. 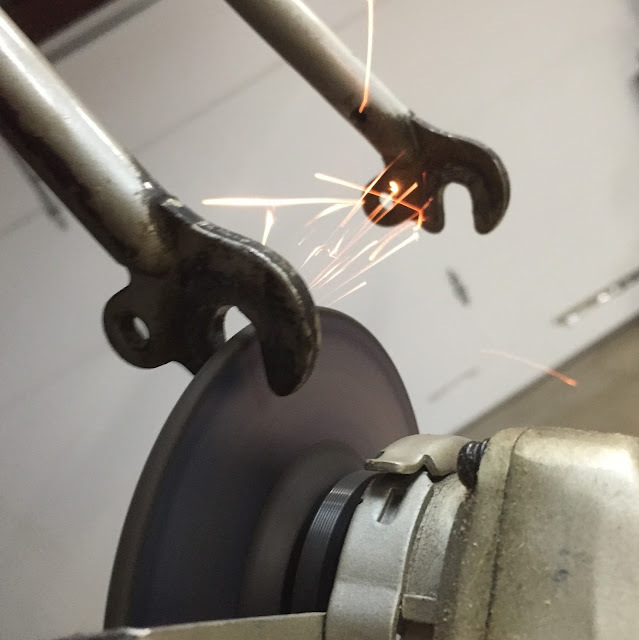 The front fork, however, was made for a narrower axle so I had to carefully grind the opening in the fork a little larger. I know that a big part of the fixie lore has to do with not having any brakes (like Joseph Gordon-Levitt’s bike in Premium Rush) and just using your legs - or the closest tree or parked taxicab - to stop the bike. But I left both brakes on, which is the fixie culture equivalent of wearing a winter coat over a Halloween costume. I was lucky to find a set of clipless mountain bike pedals I bought a year earlier a Connecticut tag sale in my workshop to use with my new fixie. I mounted it with apprehension…and will detail how the first ride went - and if I'm any closer to understanding the fascination with fixies - in another post. In the meantime, fixie owners of the world: tweet your reasons for riding a fixie to the hashtag #WhyAFixie and I’ll cover some of the findings in Part II. Thanks for reading and thanks for riding. Thanks for the article. I, too, have been perplexed by the fixie culture, and am curious why it's a thing. Too each their own, of course, I just want to understand.